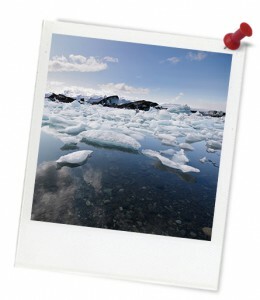 Activity details: In this activity, students learn about the different causes of sea level rise. Students conduct experiments that demonstrate how ice shelf melting may not directly affect sea levels, but how ice cap melting would. Students use maps and geometry to estimate the volume of the Greenland ice cap and then, after doing some examples, they calculate the rise in sea level that would result if the entire ice cap were to melt. Students may then conduct further research to investigate the consequences of the sea cap melting for humans and other elements of our environment. Students demonstrate that sea level rises can occur via different effects. Students understand that the size of these rises can be calculated by well planned calculations. Resources required: Internet access, printed worksheets, writing materials, ice, bucket or fish tank, other items depending upon student inquiry choices. Homework and extension opportunities: None. Keywords: Greenhouse effect, climate change, ice shelf, ice cap. Overarching learning goal: Students demonstrate that sea level rises can occur via different effects, such as melting sea ice or melting land ice. Students understand that the size of these rises can be calculated by well planned calculations. How would the earth be affected by the melting of the Greenland ice cap? Next, advise your students that they will be conducting experiments to model melting ice and sea level rise. Students can work in small groups/pairs and they should follow the instructions on the Student Worksheet provided. Before the lesson begins collect the following resources. Activity 2: What if the entire Greenland Ice Cap melted? Aim: To observe the effects of melting ice on the Earth's oceans. Instructions - Part A: Modelling an ice shelf. Step 1. Pour some warm water (about 5cm deep) into your large tub. This represents the ocean. Step 2. Add some ice to the water. Make sure all the ice is floating (not in a big pile that sits on the bottom of the ocean). This ice represents the ice shelf. There are ice shelves at the north pole and the south pole. An ice shelf is made up of a thick layer of ice that floats on the surface of the ocean. This is the ice that breaks off to form icebergs. Step 3. Measure with the ruler the depth of the water (make sure that you are measuring to the surface of the water, not the top of the ice blocks.